By Antara Dasgupta in Government Documents, Ration Card on May 18, 2018 . Before PAN cards and passports came into being, ration cards served as a proof of identity and address. It still works as an identification card to get official government documents. Also, most importantly it is issued to the deserving households in order to get food grains and fuel in a subsidized rate. Ration Cards are issued to people depending on their financial status in society i.e. how much they earn on yearly basis. In this Article, you will find detailed information about the EPDS TS Food Security Card Application Process. APL (Above Poverty Line) – Individuals fall in this category who earns more than Rs. 10,000 annually and they are provided with white ration card. Also people falls in this category are not liable to receive subsidized food grains through government. BPL (Below Poverty Line) – Individuals fall in this category who earns less than Rs. 10000 annually and they are provided with pink ration card. Antodaya or AYY families – Individuals who are extremely needy and don’t have a steady income like daily labors, falls in this category and they are provided with a yellow ration card. After the separation of Telangana and Andhra Pradesh, Telangana Government started issuing new ration cards to the citizens. As discussed above, it is an extremely important document which one should apply for. In order to prevent fraudulence and multiple duplicate ration cards, Telangana Government have came up with a more secured application format, The Government has initiated ‘MeeSeva‘ which means ‘At your Service‘ for the convenience of people. Under the MeeSeva civil supplies department, citizens are provided the option to get a new ration card, addition or deletion of a member in the ration card and other such updates, transfer of ration cards, etc. Download the Telangana new ration card application form or click here to download. Also fill up gas connection details, occupation and annual income etc and paste a recent photograph on it and send it to the officials after attaching the required documents. A copy of original resident proof. Duplicate copy of age certificate / school leaving certificate of the head of the family. Income proof of the family that income of the family is below from the prescribed limit. A copy of identity proof like voter ID card, driving license, Aadhaar card. Once applied, the Government of Telangana launched an online portal (Telangana Meseva portal) where one can check the status of their food security card as well. And insert the provided reference number to check the status. Along with status check, you can also check the status Transaction Details and download a Duplicate Ration Card. In order to perform these mentioned steps on the official website of Telangana, you will have to fill in the form providing your Ration Card Number and Click on search. Etela Rajender who is the Minister for Finance and Planning and Civil Supplies launched Telangana T – Ration Mobile App in order to bring transparency in the Telangana state Public Distribution System (Telangana e-PDS). It is an android mobile application, which will work in two modules G2C (Government to Customer) and G2G (Government to Government). National Informatics Centre (NIC) played a role designing the app. This app will cut the need of the physical visit to the ration card office. To download the app, the cardholders are required to download the app from the Google play store and they can get direct access to the features like stock position, distribution pattern etc. Visit Google Play Store on your android mobile. 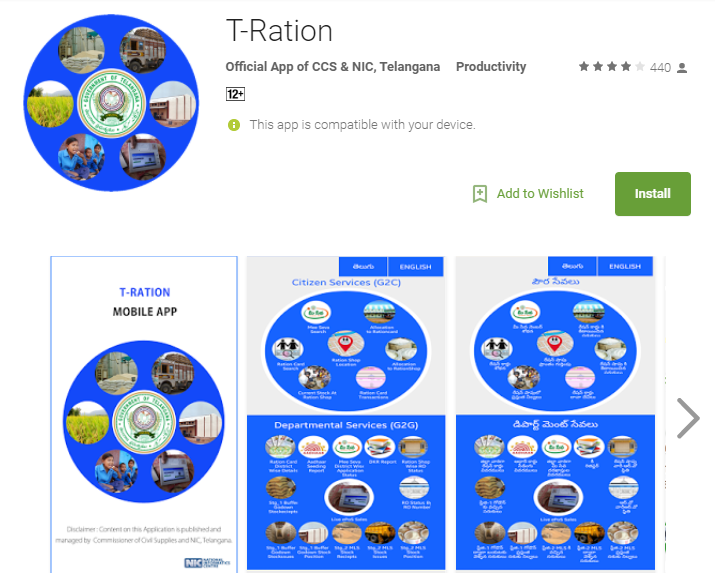 Search for Telangana T–Ration App. i have all these documents which is mention in your website.So can you apply for the new ration card for me.